I felt very safe. They had cameras around and the area is pretty safe. The place was very clean. Gabrielle is great. Plenty of room and clean. A short $9 uber ride to Bourbon Street. Lower Garden District Gem! 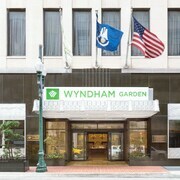 Close to Convention Center, Downtown, French Quarter! Everything was excellent from the room, to the location, as well as the service. I would recommend this place to anyone.